Asamoah Gyan is never far away from the sports headlines in Ghana. Whether he is scoring goals, singing, or missing penalty kicks, he has been in the spotlight for almost a decade. Now he will be Ghana's leader on the pitch, and with that will come even more scrutiny. Black Stars coach Kwesi Appiah earlier this week announced Gyan's appointment as the substantive captain of Ghana, taking over from his former Sunderland team-mate John Mensah. Mensah, in Appiah's words, has been "elevated" to general captain as he struggles to find a new club and work his way back into the Ghana squad. 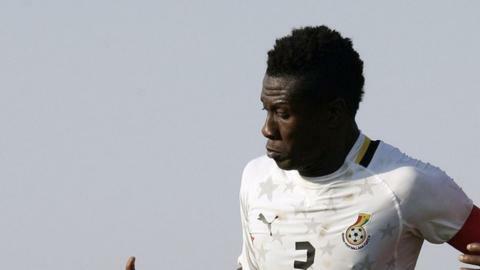 It means that Gyan will lead Ghana at 2013 Nations Cup, where they are seeking a first title in more than thirty years and their fifth in all. Gyan is naturally thrilled. In a carefully worded statement, the UAE-based striker said it is a "tremendous honour" to be Ghana captain and has hopes the country's long wait for a major title will end under his leadership. But it won't be an easy ride for Gyan. Some have questioned his choice as captain on two main grounds. They say the fact that he missed a penalty kick against Uruguay that would have taken Ghana to the semi-finals of the World Cup and also failed with a spot-kick in a semi-final defeat to Zambia in January this year suggest he is brittle and can't be trusted to lead when the stakes are high. And there is also resentment among some people over Gyan's decision to quit international football, albeit temporarily, when he was criticised for his penalty miss against Zambia. Not everyone agrees, of course, and Gyan's status within the Black Stars squad matches that of any player. Ghana coach Kwesi Appiah is a huge Gyan fan and has side-stepped what the Ghana Football Association claims is an agreed policy of giving the captaincy to the most experienced member of the squad, which would have been either Sulley Muntari or John Paintsil. In defending the choice of Gyan as captain, Appiah said: "He is generally loved and revered by almost all his colleagues. He is not simply one of the longest serving members of the team, his consistency and leadership qualities make him my preferred candidate." In becoming Ghana captain, Gyan who made his international debut back in 2003, will be following in the footsteps of some great Ghanaian players. Three-time African Footballer of the Year Abedi Ayew Pele is the benchmark. He skippered Ghana in four Nations Cup competitions between 1992 to 1998 and led with a distinction on the field that is unmatched to date. Charles Akunnor replaced him and admits stepping into those huge shoes proved a major challenge. Then there is Stephen Appiah, who captained Ghana to its first World Cup appearance in Germany. He is remembered as the captain who wore his heart on his sleeve and rose to the occasion when required. Gyan's critics say it is precisely that quality that he lacks but former Ghana international Nii Odartey Lamptey believes Gyan should be able to handle the pressure that comes with the armband. "He has had his problems with the Black Stars but he is experienced enough to know what the issues are," Lamptey said. "To be a good captain he must be a good bridge between the players and management. If he can't do that then he will be a failure. "But above all the players must respect him well enough to listen to him and that comes with him being a good player on the pitch and good character off it." Black Stars officials say Gyan is both. His disciplinary record with the side is unblemished and his record of a goal at international level in every two games is unmatched by any Ghanaian striker in recent years. He struck the country's first goal at the World Cup against Czech Republic in 2006 and went on to add another three at the same competition four years later. In 2010, he scored six of the country's nine goals as the Black Stars reached the final of the Nations Cup and the quarter-finals of the World Cup. But in between those events, Gyan has struggled with Ghana. He threatened to walk out of camp when he was widely abused for missing goal-scoring opportunities at the 2008 Nations Cup. And he re-lived those emotions all over again following his penalty misses against Uruguay in 2010 and Zambia earlier this year. Being captain for the Black Stars, whose fans demand a victory in every game, means there could be more storms on the horizon for one of Ghana football's most dominant characters.